Michel Suleiman (born in Amsheet, Lebanon, 21 November 1948; age 63 years) is the current president of Lebanon. 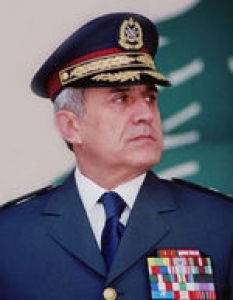 Before serving as president, he held positions as Chief of the Lebanese Armed Forces. After the commander Émile Lahoud ABL served as president in November 1998, Suleiman succeeded him as commander of the army in December the same year. ABL chief office is devoted to a Maronite Catholic. Suleiman later was elected president and sworn in on May 25, 2008. Suleiman was born in Amsheet. He joined the Lebanese Armed Forces in 1967 and graduated from the Military Academy with the rank of Second Lieutenant in 1970. General Suleiman holds a Bachelor of Arts in Political Science and Public Administration from the University of Lebanon. He was married to Wafaa Suleiman and has three children. He is fluent in French and English. During his military service, he earned a promotion from infantry platoon leader to battalion commander, and later served as coach at the Military Academy and Officers in the Regular School. From December 4, 1990 until August 24, 1991 he was appointed Chief of the Intelligence Branch of Mount Lebanon. On August 25, 1991, he moved to the post of Secretary General of the Army Staff until June 10, 1993. He served as commander of 11th Infantry Brigade from June 6, 1993 until June 15, 1996, and at that time there was a bloody confrontation with Israeli soldiers in the western Beqaa Valley and South Lebanon. On January 15, 1996 he was appointed Commander of the 6th Infantry Brigade until December 21, 1998, when he was appointed Commander of the Armed Forces. On May 19, 2007, the Lebanese Army is involved in a protracted conflict with Fatah al-Islam, a terrorist organization based in Refugee Camp Nahr al-Bared in northern Lebanon. This conflict lasted up to 2 September 2007 and ended after the Lebanese Army is fully mastered this camp and defeat Fatah al-Islam. A number of 170 Lebanese soldiers, 226 members of Fatah al-Islam, and 64 civilians (mostly Palestinian refugees) were killed in the fighting. Result of a number of factors, including balancing the interests of citizens of Lebanon, concerns about safety of Palestinian refugees, and the fragile political balance in Lebanon at the time, Michel Suleiman was forced to take the conflict to be very careful.